DxO is a company that says it advances the way people take photographs and their background is in creating software for correcting optical and digital imperfections in images. Now they’ve launched the ONE, a standalone pocket camera that can also be attached to an iPhone or iPad to offer a large interactive viewfinder and other powerful DSLR features. Whilst the iPhone/iPad element may seem like a bit of a gimmick, the camera itself is jam-packed with some great and other good-enough features that make it a very interesting little camera. And once the camera is connected to an iPhone or iPad, DxO’s app opens to allow you to take control. You can use the fully automatic setting and a small collection of scene modes or go for the program, shutter priority, aperture priority and manual exposure modes. And DxO claims the ONE also includes the world’s most advanced image processing well that’s not at all surprising. Image formats include raw (DNG) and JPEG files, with raw files being saved to the microSD card in the camera and JPEGs to either the card or the iPhone, depending on what you prefer. As well as stills, the ONE can be used to shoot 1080p video at 30fps or 720 at 120fps (for slow motion playback) in MOV (H.264) format. 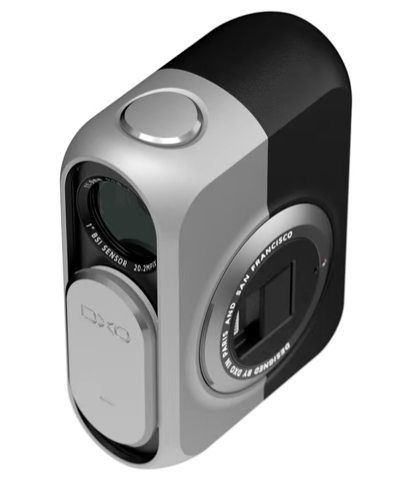 However, DxO is keen to point out that the ONE is aimed at serious photographers rather than action cam users. The only negative in the whole “picture” would be the slightly higher than expected price tag of £499 RRP and the fact that you need to take care not to cover the lens.